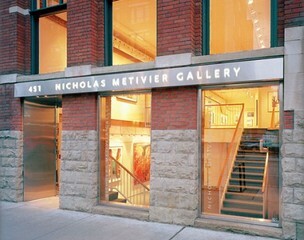 Nicholas Metiver Gallery is one of the largest contemporary galleries in Canada. Founded in 2004 in Toronto by Nicholas Metivier, the gallery represents Canadian, European and American artists of different generations. The gallery handles work in all media, including painting, sculpture, photography, film, video, drawing and printmaking. The gallery continues to develop its exhibition program with the introduction of young artists as well as initiating and supporting exhibitions of gallery artists nationally and internationally. The gallery is committed to the long-term development of each artist’s career. Nicholas Metiver Gallery is a member of the Art Dealer's Association of Canada.